On 15 August 2017, on the day of the 55th anniversary of the “Act of Free Choice” marking the annexation of West Papua to Indonesia, the Papua Student Alliance (AMP) and the Indonesia People Front for West Papua held several rallies to demand a referendum on self-determination. The protesters were brutally prevented from demonstrating near the State Palace. Around 100 people were arrested by the police while dozens were injured. Previously, on 2 August, 30 West Papuan students from the AMP had gathered in commemoration of the 1969 Papuan People’s Free Choice (Pepera), known as the “Act on NO Choice” by Papuans. Read more about it here. Hundreds of people were arrested during protests held in several Indonesian cities to mark the 55th anniversary of an agreement that saw West Papua become part of Indonesia. Organized by the Papua Student Alliance and Indonesia People Front for West Papua, the rallies were held simultaneously on Aug. 15 in several large cities across Java, including Yogyakarta, Semarang, Malang and the capital Jakarta. Police moved in quickly to break up the protests in which protesters demanded a referendum on self-determination, according to rights group Jakarta Legal Aid. "Almost 100 people were arrested and dozens were injured," said Veronica Koman, a human rights lawyer, adding that those arrested "were released after questioning." 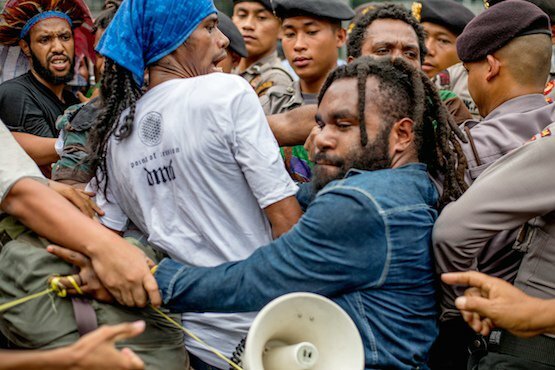 In Jakarta, Papuans were blocked from protesting outside the State Palace by police, sparking clashes that resulted in the arrests of all the protesters. The rally was to commemorate the 55th anniversary of the New York Agreement in 1968, a US-brokered deal under which the Netherlands agreed to transfer control of West Papua to Indonesia, pending a UN-administered referendum. The agreement, which Papuans were not party to, paved the way for the 1969 Act of Free Choice which gave Indonesia control of the former Dutch New Guinea. A low level insurgency has been waged since then. Frans Nawipa, coordinator of the Papua Students Alliance said that since the agreement was manipulated, so Indonesia must give self-determination rights to Papua. "The UN must also be actively involved in a fair and democratic process toward self-determination because of its active role in allowing the annexation of West Papua by Indonesia," he added. Nawipa also demanded the withdrawal of the military from Papua as a condition of peace. "If this is not done, then the violence [committed by the authorities] will not stop," he said. Despite its rich resources, Papua is among the poorest regions in Indonesia and shootings of civilians is very common, activists say. According to the Commission for the Disappeared and Victims of Violence, there have been 16 shootings in Papua since August last year — none of the perpetrators have been caught. The latest was on Aug. 1 in which one person was killed and seven injured. Referring to the protests, Father John Djonga, a rights activist, said there is no sign of the state apparatus ending the intimidation of Papuans. "As long as they [protesters] do not use violence, the state should let them voice their aspirations. It's part of democracy and freedom of expression," he said.